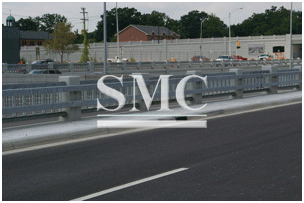 The hot-dip galvanized coating is made up of 98% zinc – a natural, healthy metal. Zinc exists naturally in the air, water, and soil and is the 27th most abundant element in the Earth’s crust. More than 5.8 million tons of zinc is naturally cycled through the environment by plant and animal life, rainfall, and other natural activity. And zinc is essential for all life – from humans to the smallest microorganisms. Therefore, utilizing hot-dip galvanized steel is not harmful to the environment as the zinc is already naturally found in the area. In addition to being natural, zinc, like steel, is infinitely recyclable without the loss of any physical or chemical properties. Approximately 30% of the world’s zinc supply comes from recycled sources each year, and more would be recycled if it were available. Furthermore, steel is the most recycled material in the world with virtually 100% of structural steel coming from recycled sources, making galvanized steel an infinitely renewable material. A life-cycle assessment (LCA) is an objective measurement of a product’s environmental impact. Often called a “cradle-to-grave” study, LCA quantifies the environmental impact of a process or product from raw material acquisition, energy inputs and emission outputs during production and use, and end-of-life management recycling/disposal). LCAs have begun to gain favor in the specification community as a means of gauging a product’s sustainability. 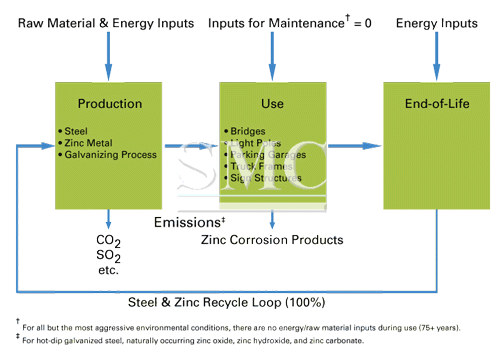 In 2008, the International zinc Association (IZA) hired internationally renowned LCA experts Five Winds International and PE International to conduct a life-cycle inventory (LCI) and life-cycle assessment (LCA) for hot-dip galvanized steel. Utilizing data from worldwide sources regarding energy consumption and air/fluid/solid emissions measured during zinc roduction and during the actual galvanizing process, combined with analogous survey data collected from the steel industry, an LCA for hot-dip galvanized steel was compiled. This study provided a baseline understanding of the industry’s impact today, one the AGA is committed to improving in the future.